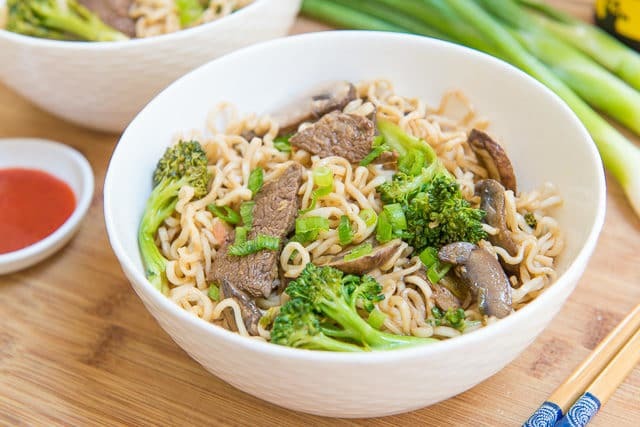 This Ramen Noodle Stir Fry with beef, broccoli, and mushrooms only takes 20 minutes to make. It has delicious Korean flavors, and is perfect for a weeknight dinner! This is one of those “dangerous” meals where I have the hardest time practicing portion control, but I can’t even be mad about it because it’s so delicious. Such is often the case when I make Asian noodles. I fill up my bowl for dinner at the table, and then when I go to put the leftovers away, I sneak a few more bites at the counter, despite promising myself I must sit at the table when I eat. It’s bad. But so good. While this Korean Beef Noodle Stir Fry isn’t a traditional Korean dish, it has some of my favorite Korean flavors from my childhood. Plus, there are ramen noodles involved. I’m a sucker for those. If you’re weary of the idea of ramen, don’t worry, we’re just using the noodles, and not the packets of weird ingredients that they sometimes come with. You can actually purchase ramen noodles by themselves, without any additional ingredients. We’ll add our own fresh flavor! Toss well to coat, then let the steak sit for 10 minutes. While the steak marinates, I use that time to prep the veggies. You’ll need sliced mushrooms and broccoli florets. You also want to get a pot of boiling water going so you can boil the ramen noodles while you stir fry the beef and veggies. That way they’re hot and ready for the skillet! 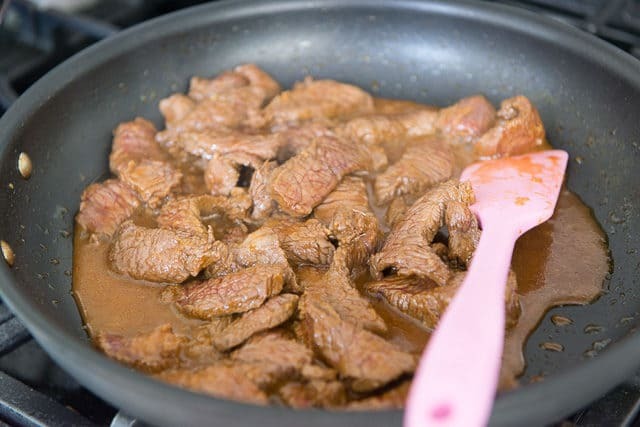 Heat a large skillet or wok over high heat, then add the marinated beef. Cook for 2-3 minutes, until about 80% cooked through. 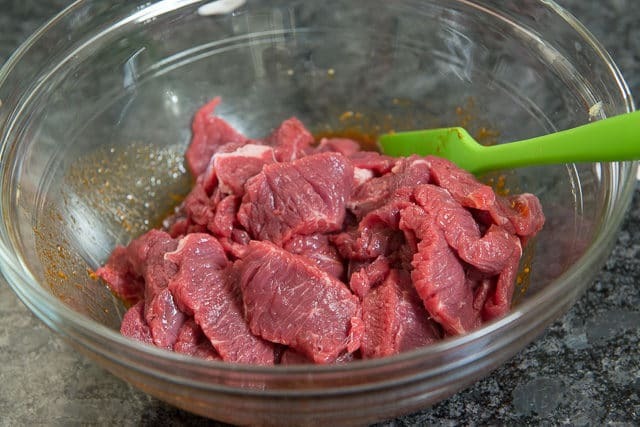 Remove the mostly cooked beef and sauce to a bowl. Cool, now back to the skillet. Stir fry for 2-3 minutes until crisp tender. I also recommend this Korean Kalbi Beef or these Korean Chicken Rice Bowls for more great Korean dinners. Enjoy! 20 minutes is all you need to make these flavorful Korean Beef Noodles. This quick and easy stir fry is perfect for a weeknight dinner! 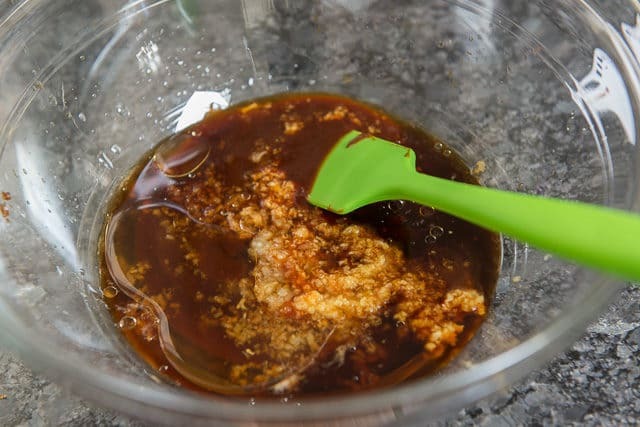 In a small bowl, whisk to combine the gochujang, soy sauce, oil, rice vinegar, garlic, and ginger. Reserve ¼ cup of the sauce and set aside. Bring a pot of salted water to a boil to cook the ramen noodles while you stir fry the beef and vegetables. Heat a very large skillet or wok over high heat, then add the steak. Cook for 2-3 minutes, stirring often, until about 80% cooked through. Remove the mostly cooked steak to a bowl. 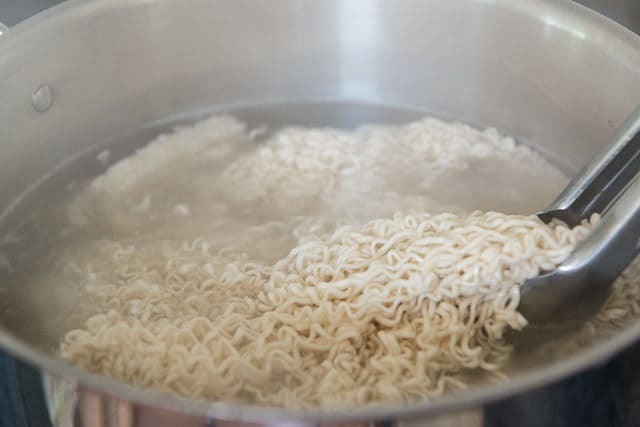 When the pot of water has come to a boil, cook the ramen noodles for 1 minute less than the package directions (mine said to cook for 3 minutes, so I did 2). 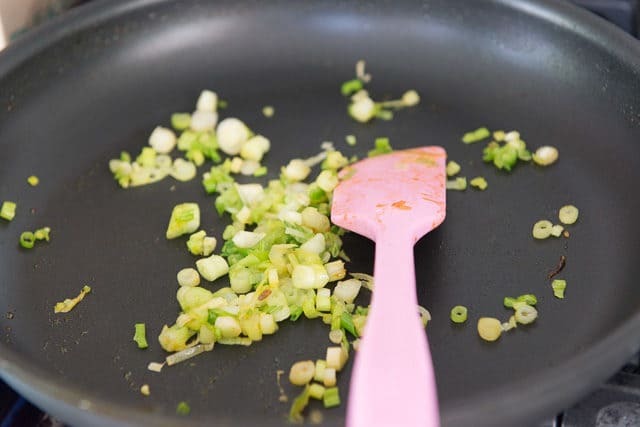 While the ramen cooks, add the scallions to the pan and cook for 30 seconds, stirring frequently. 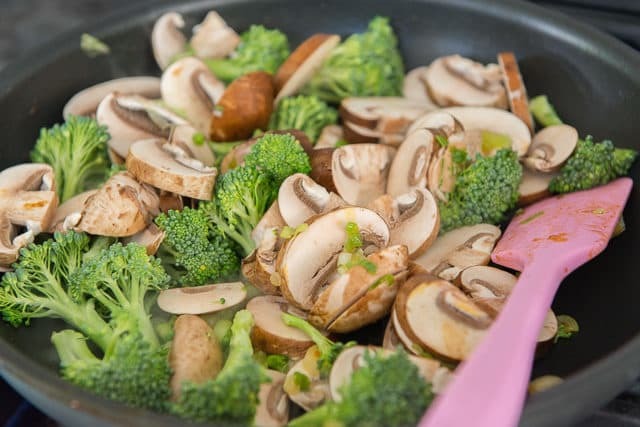 Add the broccoli and mushrooms, and stir fry for 2-3 minutes until crisp tender. 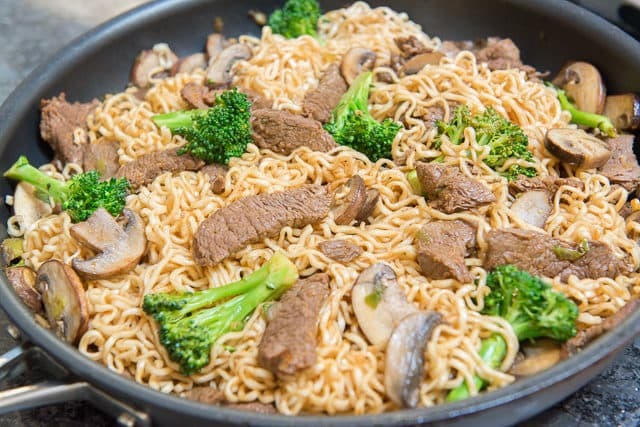 Drain the ramen noodles, then add to the skillet. 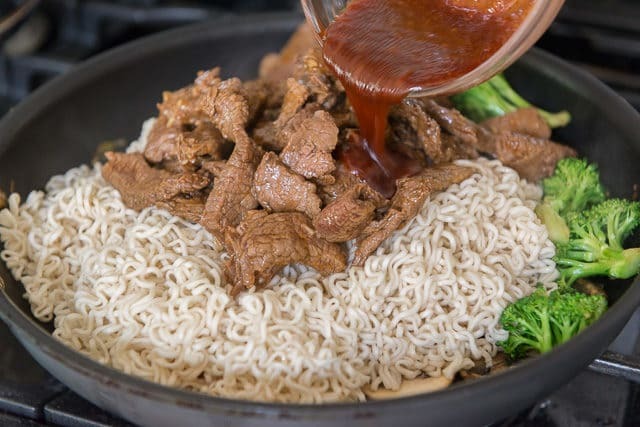 Add the mostly cooked beef and reserved sauce to the pan, and toss for 2 minutes, until the sauce is well distributed and the beef is fully cooked through. Serve and enjoy! *Gochujang is a Korean red chili paste that's savory, sweet, and spicy. It is essential to get this ingredient, and fortunately it has become widely available. If you don't have an Asian market near you, I am able to purchase it at my local Whole Foods. **When I make this recipe, I start by making the sauce and marinating the steak first, then I prepare the vegetables and clean up while the steak is marinating. 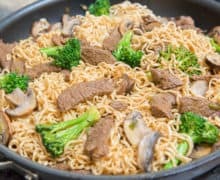 You also want to cook the ramen noodles while you're stir frying the beef and vegetables, so they're hot and ready to add to the skillet and bring everything together. Hi what brand ramen do you use? Hi Jane, I’m not seeing the same brand at Whole Foods anymore, but “chinese noodles” is what you’re going for if you’re buying it without the extra soup powder. 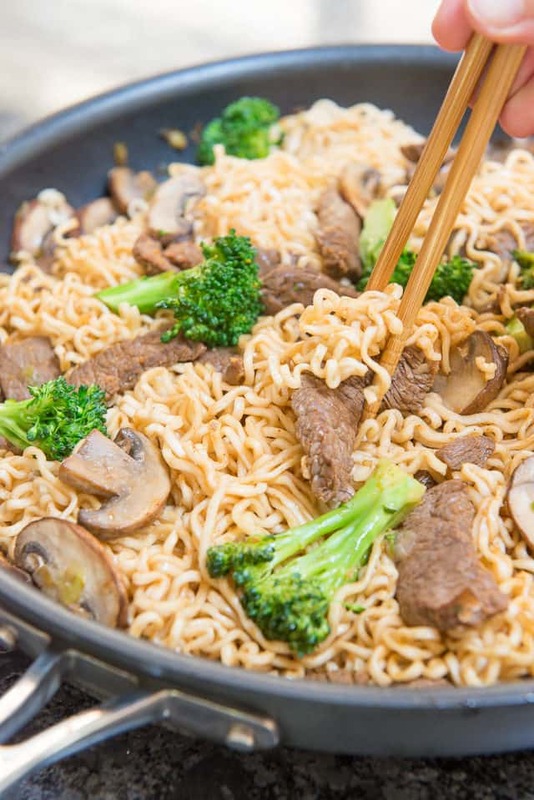 This looks like an EXCELLENT Beef Noodle Stir Fry! Really glad you enjoyed both dishes. Happy holidays! !